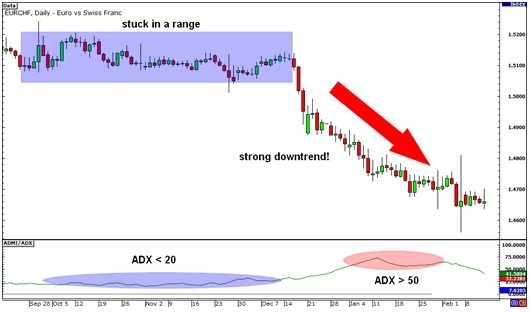 ADX for short, is another example of an oscillator. It fluctuates from 0 to 100, with readings below 20 indicating a weak trend and readings above 50 signaling a strong trend. In this first example, ADX lingered below 20 from late September until early December. As you can see from the chart, EUR/CHF was stuck inside a range during that time. Beginning in January though, ADX started to climb above 50, signalling that a strong trend could be waiting in the wings. And would you look at that! EUR/CHF broke below the bottom of the range and went on a strong downtrend. Ooh, that’d be around 400 PROFITs in the bag. One way to trade using ADX is to wait for breakouts first before deciding to go long or short. ADX can be used as confirmation whether the pair could possibly continue in its current trend or not. Another way is to combine ADX with another indicator, particularly one that identifies whether the pair is headed downwards or upwards. ADX can also be used to determine when one should close a trade early. For instance, when ADX starts to slide below 50, it indicates that the current trend is losing steam. From then, the pair could possibly move sideways, so you might want to lock in those PROFITs before that happens.